Dallying In The Dirt, Issue #273 - 320 Crocus Tommy find a new adventure in the back yard. Rejuvenating the lawn in the back yard has been a summer long project. The early summer heat and some black plastic was used to kill all the little bit of grass and the mass of ground ivy that made up this small piece of lawn. All summer it was too hot to even consider trying to germinate grass seed so we just occasionally hoed down the several weeds that managed to grow despite the heat and drought. It has finally cooled and I rototilled it just deeply enough to get the necessary loose soil to level it. Then I had this brilliant idea. I had ordered a box of Crocus thomasinianus without any real thought about where I might plant them. Why not have them emerge all over this new piece of lawn in the early spring? Why do my brilliant ideas always seem to create more work for myself. 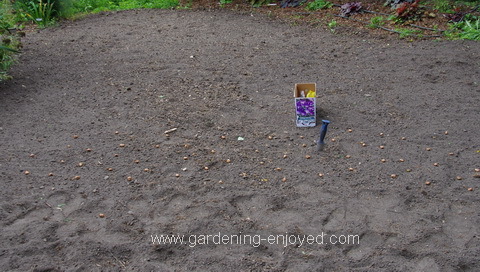 Instead of digging big holes and planting them in clumps, I spread them out over most of this freshly raked soil and dug 320 individual holes for them. These Crocus “Tommy” as they are sometimes called are the Crocus of choice because squirrels will not eat them. I did find one dug up with a single bite out of it, reminding my bushy tailed tree rats why they don’t like them. Grass seed will go down tomorrow and then we will begin the morning and evening waterings to keep the seed moist enough to germinate. If the plan works, that part of the yard should be amazing in early spring. Over in the vegetable garden some of the Earthbox containers are producing a nice second crop. 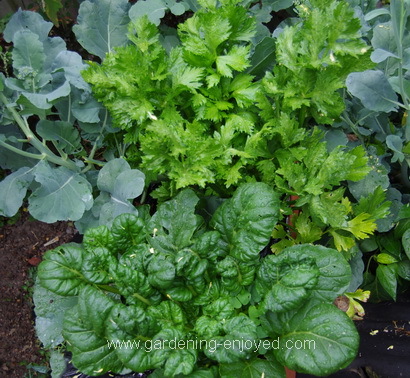 In this one we have some Celery that was planted in the late spring after the Pak Choi had been harvested. Some Broccolini that was planted in the early spring and then cut back after the summer’s heat and is now producing lovely little florets. In the front is a healthy Komatsuna, a type of leafy Pak Choi. It was seeded directly into that gap in the Earth Box a few weeks ago and it will be on our dinner plates very soon. The next container over is filled with Lettuce that was direct seeded into the box around the last weeks of August. We have already had several salads from that crop. There are no Melons to be found. This huge production of Dahlias was planted in front of the trellises that the Melons were supposed to grow on. 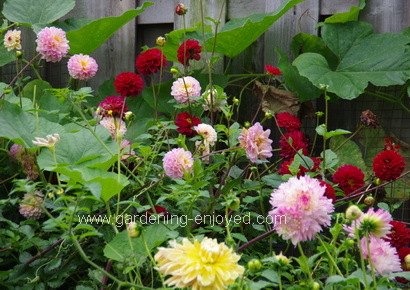 Who thought the Dahlias would grow 2 M tall and fill out so well. The poor Melon plants are completely shaded and overwhelmed by them. I grew a few more Dahlias this year because they make such great cut flowers. There have been bouquets of them in the house since mid summer and now that the cooler fall days are upon us they have really taken off. Three of those giant flowered types make an impressive display on the dining room table. The dark red and pink, small flowered, ones are gathered by the handful and used in large vases throughout the house or taken to friends. Giving away the results of my hours in the garden is one of the great joys of being a gardener. My enjoyment of these colourful delights is somewhat tempered by the their size. If they have grown that big, I know that when the frost finally knocks them down I will find huge clumps of tubers when I dig them up. That means more winter storage space and some very large pots to start them in next spring. I’ll just look at these pictures of them in March and stop complaining about these temporary problems. Anne Asks? Hello Ken, I've been reading that bone meal is not what it used to be and now has no nutritional value for bulbs. Do you recommend using any kind of fertilizer when planting bulbs? Ken Answers! I use Blood meal, not blood & bone, in the hole with the bulbs and then Acti-sol, a dehydrated chicken manure, to top dress the soil after planting. Both are good organic fertilizers and both deter squirrels.